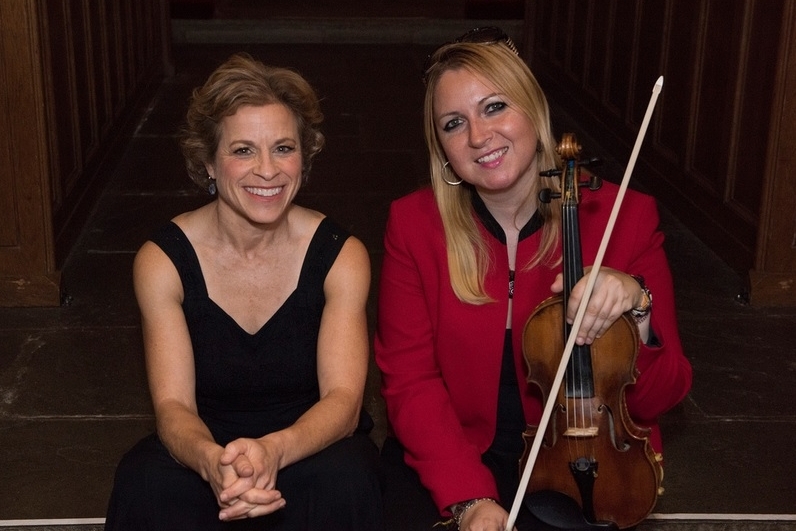 The dynamic duo of violinist Claudia Pellegrini (bow) and pianist Lori Rosolowsky (pedal) performs Spicy and Sweet: A Musical Treat. They sing sweet harmonies in four languages and spice up their program with multiple instruments, humor and a few surprises from classical to jazz, show tunes and original music. Claudia Pellegrini moves from cajon (a drum she sits on) to piano in “The Girl from Ipanema,” which she sings in Portuguese. The duo sparkles every time Claudia has her bow in hand. Pianist, singer, songwriter and comedienne Lori Rosolowsky, surprises audiences (and herself) as she "learns" to play the violin on stage. Her soulful arrangement of “Send in the Clowns” and her upbeat original song “Great Divide” move the audience figuratively and literally! And her virtuosic pianism on "Tea for Two," with Claudia's violin adding the spice, is as fun to watch as it is to hear. The duo's chopsticks duet is a hilarious nod to the Marx brothers. Because Claudia lives in Pennsylvania and Lori lives in Montana, Pedal & Bow is a rare treat, indeed.